The Take Arms! Jam is a week long jam based around creating, modifying, personalizing, trading or selling weapons. Be it a pulse rifle, short sword, cross bow or whatever cool, modular weapon your brain can think up! Arms are not limited to weapons however, they could happen to be deadly tools, like a grappling hook that grabs people, or a mining laser that burns the skin of your victims. Your game can be 2D or 3D, pixelated or painted. As long as you can sell, build, upgrade or customize your armaments, you're set. Follow @Vexrak on Twitter to keep up to date with themes or general rule changes! 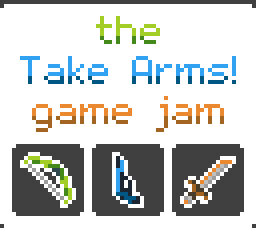 Use #takearmsjam to spread the word, or to share your dev progress. You can also share your progress at the community page. We also have a Discord channel hosted by Eclipse, for general conversations, dev progress updates and announcements, click here to join. Finally, if you'd like to make a game, but you don't know how to code, make art or music visit our CrowdForge page to assemble a team! Pick your favorite theme and start working on your game submission! If you want, you can post your progress either on our Discord or on our community page. There will be three secondary themes voted upon and announced right before the jam starts. These will dictate some features of your game, usually through a core mechanic or genre. However, they are unnecessary, just recommended in order to get a high score in theme. So if you'd like to start early you totally can! - I'm sure you get the point by now, but just in case... you must have custom killing tools. Have a question that's unlisted? Go to the community page and ask it there. I'll try to help out as soon as possible. A: Yes, they're encouraged to join! If you need a team, go to our CrowdForge page! Q: Which platforms and engines are allowed? A: As long as your game can be uploaded to itch.io it's allowed. Though I'll personally be judging on a Windows based PC. Q: Is there a limit to how many games I can upload? A: Nope, share as many games as you'd like. Q: Can I use royalty free sounds and music? A: Yes, but it's highly appreciated if you make your own. Take into consideration that sound design will be judged. Q: How about using sprites I didn't create? A: If you have legal permission to use those images, it's allowed. Though again, it's highly appreciated if you make your own. Q: I was too late to upload my game to the jam! Can I still upload it? A: Of course! Please do. If you ask, I'll give you a late submission link. A man on a journey runs into a stranger asking for some help.